"I knew when I married Corey that we were in for a lifetime of adventures together, but I never would have imagined that our fates would focus on grilled cheese and tomato soup! As time goes by and our story grows, it only goes to prove that with the right partners, hard work, and the determination to never give up we can achieve anything." Founder Jenny Rachford currently heads up the HR and Administrative department at Tom+Chee company headquarters and coordinates the company’s charitable giving endeavors. She approaches her team with a “bring it on” attitude and a personal goal to keep the smiles and positive outlook rolling day by day. Focusing on a lifelong love of books and education, Jenny completed her education at Northern Kentucky University with a degree in English and Creative Writing. From there, she joined the retail world with Barnes & Noble and it wasn’t long before she realized the constraints of corporate structure even while surrounded by a wealth of vast knowledge and creative co-workers. Feeling ready for a big change, she took the lead of a friend who suggested she give the restaurant industry a try, and thanks to a heavy recommendation was able to land a job serving cocktails at one of Cincinnati’s newest fine dining restaurants on Fountain Square. That’s where she met Jenn and Trew Quackenbush and later the 4 became good friends. 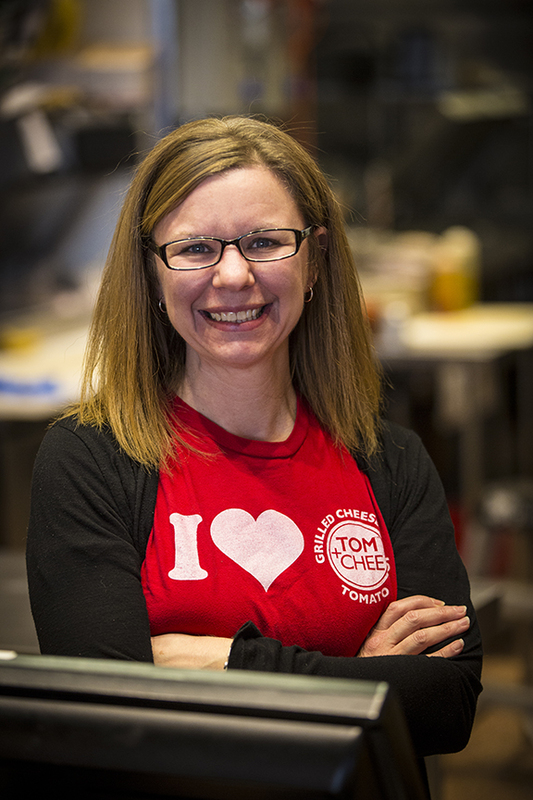 Jenny took advantage of an opportunity to join the Public Library of Cincinnati, but remained focused on contributing to the success of Tom+Chee. 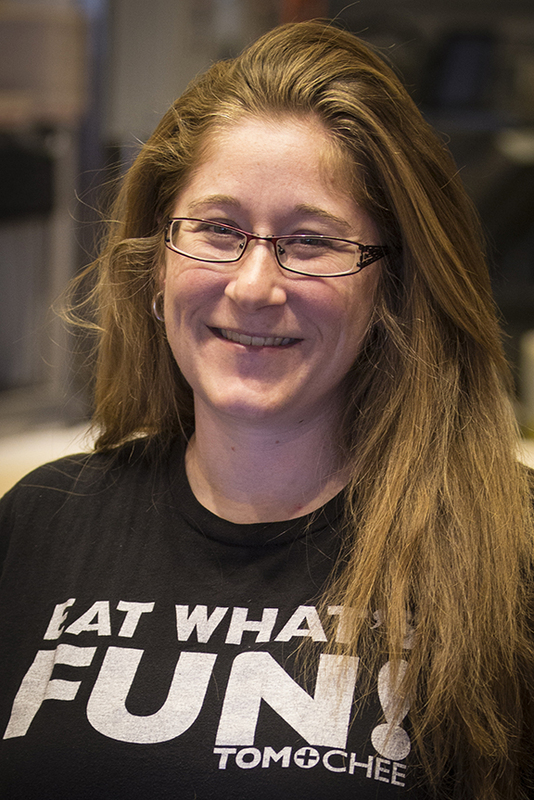 After the birth of their daughter and the success of their Shark Tank appearance in 2013, the opportunity came to join the Tom+Chee family full time to afford Jenn Quackenbush the ability to focus on franchise development. Although overwhelming and at times daunting, Jenny has relied on her team and every resource possible to expand her knowledge and input to the business. Her biggest goal is to build relationships with and between the franchisees, company HQ team, and their local operational crew, knowing that every single person involved brings a unique value and spirit that adds up to what makes Tom+Chee so awesome and better than any other restaurant. Founder Jenn Quackenbush currently heads up the Franchise Development department at Tom+Chee company headquarters and assists in Real Estate development. Jenn also plays a pivotal role in the Company’s annual Christmas toy drive. Jenn went Morehead State University and Northern Kentucky University to pursue a degree in Social Work. Once Jenn started down the path of Social Work, she found herself wanting to return to the restaurant business. Having started on her 16th birthday at the Coney Island Amusement Park, she was responsible for prepping food for special events for groups ranging from 50 to 1000 people. She found this work to be exciting. This job taught Jenn what work ethic was all about! Jenn’s first big corporate restaurant role was in 2000 at Restaurants Unlimited’s Palomino restaurant on Fountain Square in Cincinnati, OH. Jenn started as a host at the restaurant. From there she worked her way through the front of the house from busser, to server to bartender and eventually into management of the restaurant.. In 2005 Trew Quackenbush transferred from a Restaurant’s Unlimited unit in Anchorage, Alaska to the warmth of Cincinnati, Ohio where he would meet Jenn at the Palomino restaurant. From Palomino Jenn went to work opening Cincinnati’s first McCormick and Schmick’s restaurant. After McCormick’s Trew was promoted to a position in Indiana. Having married by then, Jenn went to Indiana with Trew where she opened a Red Robin. Clearly restaurants had taken a hold on Jenn’s career. Shortly after opening the Red Robin, the couple decided to return to Cincinnati where they would work for together at two of Cincinnati’s highly regarded, high volume restaurants. The couple celebrated the arrival of their daughter, Cici, in 2009. It was only months later that they joined forces with Corey and Jenny to launch the Tom+Chee restaurant concept.